A show at the MFA Boston looks at the influences on and of Ansel Adams. 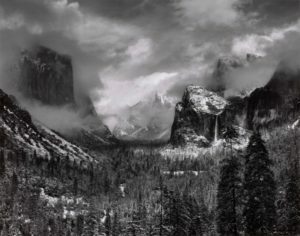 Ansel Adams, Clearing Winter Storm, Yosemite National Park, about 1937, photograph, gelatin silver print. Mitchell Epstein, Altamont Pass Wind Farm, California, 2007, photograph, chromogenic print. Before Ansel Adams famously photographed Yosemite National Park, there was Carleton E. Watkins, a New York-born photographer who decamped to San Francisco in 1849 during the Gold Rush. Instead of finding gold, Watkins became one of the earliest and most important American landscape photographers. He started out as an apprentice to Robert Vance, a pioneering daguerreotypist, and quickly began making money shooting mining estates. He shot Yosemite in the summer of 1861 with a steroscopic camera and a mammoth-plate camera, which used 18-by-22-inch glass negatives. His sweeping panoramic views of what was then known as the “Yo-Semite Valley” showcased the region’s breathtaking waterfalls, mountains, gigantic trees, and wilderness. 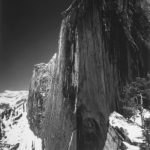 At the time, it was largely untraveled, and most viewers had never seen Half Dome, Cathedral Rocks, and El Capitan before Watkins’ photographs. In fact, Watkins is generally credited with Yosemite’s becoming a national park in the first place. In the 1860s, while the country was in the throes of the Civil War, logging and mining companies were eyeing Yosemite’s rich resources. As the story goes, California Senator John Conness, who owned a cache of Watkins’ work and told Congress that Yosemite was home to “perhaps some of the greatest wonders of the world,” showed several photographs to President Abraham Lincoln. A year later, in 1864, Lincoln signed a law granting the land “in the granite peak of the Sierra Nevada Mountains” to the state of California to be “held for public use, resort, and recreation…inalienable for all time.” Predating both the National Park System and Yellowstone, it was the first act by the Federal government to preserve land for the public. With a credit like this—and praise from leading artistic voices of his day such as Albert Bierstadt and Ralph Waldo Emerson—it’s surprising that Watkins and his photographs aren’t better known. The San Francisco earthquake of 1906 is partly to blame, as it destroyed Watkins’ studio and the lion’s share of his negatives (the quake also threw a then four-year-old Adams, a San Francisco native, into a wall, damaging his nose). A 1975 exhibition at the Metropolitan Museum of Art organized by the photography curator Weston Naef is largely credited with launching Watkins’ work back into the public eye. 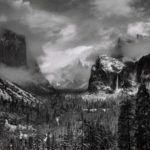 However it should be noted that Adams, who described Watkins as one of the “great Western photographers,” was well versed in the older artist’s work, often retracing his steps in Yosemite. He put several of Watkins’ photographs in “Photographs of the Civil War and the American Frontier,” an exhibition he curated for the Museum of Modern Art in 1942. 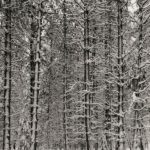 Adams’ influences, and the artists influenced by him, is the subject of “Ansel Adams in Our Time,” an exhibition that opens at the Museum of Fine Arts Boston on December 13. The show, which runs through February 24, puts Adams’ work on view alongside that of his 19th-century predecessors and 20 contemporary artists. Just like one of Watkins’ or Adams’ panoramic photographs, the show provides a sweeping view of the American West and how its wilderness, inhabitants, and environment have changed. Among the works representing 19th-century pioneers of government survey and expedition photography is Watkins Mount Starr King and Glacier Point, Yosemite, No. 69 (1865–66), which captures a serene clearing in the park near Mount Starr King, a symmetrical granite dome, and Glacier Point, a popular overlook point. The photograph’s rich textures and crisp clarity make it easy to forget that to get the shot on his photographic expedition Watkins wrangled over a dozen mules and carried 2,000 pounds of equipment and flammable chemicals. Another highlight is Grand Canyon of Yellowstone and Falls (about 1887, albumen print) by Frank Jay Haynes. With its sharp contrast between black and white and bold lines, this work would be at home among the work of the Modernist photographers. Haynes, who first visited Yellowstone in 1881, obtained a photographic concession inside the new National Park at Mammoth Hot Springs in 1884. Henceforth he became the park’s unofficial official photographer, returning every year until his death and capturing all of the sites with a mammoth camera. It wasn’t uncommon for Adams to replicate these artists’ exact views in his own photographs, effectively reinforcing iconic images of the national parks. Photographs such as The Sangre de Cristo from Marshall Pass (after 1879, albumen print) by William Henry Jackson and Heaipu, Navaho Woman (about 1879, albumen print) by John K. Hillers provide contemporary views of the 19th-century West. The former pictures a locomotive speeding through the southernmost subrange of the Rocky Mountains in Colorado, and the latter portrays a Navaho woman surrounded by and wearing traditional weavings. The work of Adams that populates the show is some of his most iconic. It comes from the Lane Collection, one of the largest and most significant gifts in the MFA’s history (some 6,000 photographs, 100 works on paper, and paintings). Traversing the breadth of American modernism, the collection features work by Charles Sheeler (his entire photographic estate of 2,500 works, to be exact), Edward Weston (nearly 2,500 works), Arthur G. Dove, Georgia O’Keeffe, Stuart Davis, and John Marin—most of whom were peers and friends of Adams’s. The collection boasts 500 photographs by Adams, making it possible for the museum to examine and reinterpret the artist’s oeuvre from seemingly endless angles. 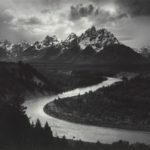 Works like The Tetons and Snake River, Grand Teton National Park, Wyoming (1942, gelatin silver print), seem to owe a lot to Adams’ 19th-century forerunners. Much like Haynes’ Grand Canyon of Yellowstone and Falls, the image’s winding body of water, gleaming like polished silver, cuts a sharp contrast to the darkened trees that surround it. The snowy tops of the Teton mountains on the horizon display a crispness that even outdoes Watkins, as their jagged peaks appear to poke into the wispy clouds. Clearing Winter Storm, Yosemite National Park (about 1937, gelatin silver print), a view of a snowy Yosemite valley, could be a shot from Watkins’s portfolio. Works such as the famed Moonrise, Hernandez, New Mexico (1941, print date 1965–75, gelatin silver print) and Grass and Burned Stump, Sierra Nevada, California (1935, gelatin silver print) feel entirely modern. The former juxtaposes the modest buildings of the unincorporated community of Hernandez with a grand, expansive sky overhead. The latter is purely Modernist, with its rich textures and zoomed-in composition. Photographs like the 1930 Cemetery State and Oil Derricks, Long Beach, California, which depicts industrial towers in the distance over the shoulder of a marble funerary statue of an angel, seem to herald postmodern photography. A Western graveyard is the subject of Bryan Schutmaat’s Cemetery, Tonopah, NV (2012, archival inkjet print). The photograph depicts a cemetery in Tonopah, a mining town in the Nevada desert. As in Adams’ photograph, equipment from mining activity is visible behind the graves, which date to the first decade of the 20th century, a prosperous time for the town. Mitchell Epstein’s Altamont Pass Wind Farm, California (2007, chromegnic print), another contemporary work in the exhibition, shows the intersection between nature, recreation, and industry. 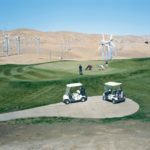 It captures a view of a golf course, which is positioned in front of the Altamont Pass Wind Farm in the Altamont Pass of the Diablo Range in Northern California. The wind farm was one of the first in the United States, with its earliest wind turbines being established in the area in the early 1980s by Fayette Manufacturing Corporation on land owned by Joe Jess, a cattle rancher. Some of the contemporary works in the show riff on traditional landscape photography. Catherine Opie’s Untitled #1 (Yosemite Valley) (2015, pigment print), for instance, provides a beautiful view of a Yosemite waterfall blurred and overexposed. Other contemporary artists in the exhibition include Trevor Paglen, Abelardo Morell, Binh Dahn, and Victoria Sambunaris. Mark Klett, who is also featured in the show, created an entire series that marries historic landscape images by 19th-century photographers with those of the 20th. In one work that Klett made with Byron Wolfe, View from the handrail at Glacier Point overlook, connecting views from Ansel Adams to Carleton Watkins (2004), the artist creates an even more panoramic view of Yosemite with a contemporary image of the park, layered with those taken by both Adams and Watkins. They fit together quite well.